How an Accurate Barometer can Make your Sailing Safer and More Efficient. Friday, Nov 6, 6 to 9 PM at CYC, Shilshole Bay Marina, hosted by the Seattle Sailing Club and Corinthian Yacht Club at Shilshole Bay Marina. No-host bar and restaurant 6 to 7, seminar 7 to 8, questions and panel discussion 8 to 9. A free public seminar and panel discussion on the role and use of barometers in sailing on both inland and offshore waters. Covers real examples of how an accurate barometer can make your sailing safer and more efficient. Examples of what can happen when you do not heed the advice they provide are also given. Presented by David Burch, Starpath School of Navigation and author of The Barometer Handbook, and Matt Thompson, NWS Port Meteorological Officer, who coordinates barometer use and other aspects of weather reports from Voluntary Observing Ships. Also taking part in the Panel Discussion is David Wilkinson, meteorologist and marine weather instructor at the Northwest Maritime Center and Robert Reeder, Chief Mate on the Victoria Clipper, who relies daily on accurate pressure to confirm the timing of UW hi-res forecasts. For more information, contact Scott Galbraith at Seattle Sailing Club. Join us for dinner and conversation on the important role of barometers in navigation. For a general background on use of barometers see Modern Barometry and its Important Role in Marine Navigation, but we will be more specific in this discussion with real examples of how the barometer ca affect your decision making. It is better to use the general appearance of the water as described by the Beaufort Wind Force Scale. Wind speed can be read from the water this way to within a few knots, after practicing with an anemometer to check the guesses. A wind speed of approximately 10 knots is the easiest to read from the water, which is fortunate because this is the wind speed at which low-powered craft must start considering the wind’s effect on progress. With no current flowing, the appearance of the first few isolated whitecaps means the wind speed is approximately 10 knots. At this wind speed, you have to search the surface to detect these few whitecaps that look like scattered bits of popcorn on the water. Current flowing into the wind steepens the waves, so they break making whitecaps more easily. With a current of 1 or 2 knots flowing into the wind, the popcorn will appear sooner, at approximately 8 knots of wind. Current flowing with the wind stretches out the waves, so the wind speed must build to 12 knots or so before any specks of white are seen. At an honest, sustained wind of 20 knots, the popcorn is the first thing that catches the eye. Individual whitecaps are bigger, and there are many more of them. During the first few hours of wind, before the seas build, the water looks like a speckled quilt of whitecaps, but there is little if any spray. Nearby wave surfaces, however, will show prominent streaks of cat’s paws (ripples that look like fish scales), which show very clearly the instantaneous wind direction. With some experience of 20 kts seas, ie knowing the density of white caps needed to be the dominant thing you see, then the more scattered density of 15 kts becomes easier to discern. So we have 10 kts, have to look hard; 20 kts it knocks you out; and 15 kts is in the middle. Note too we are talking about inland waters here for the most part... that is we are rarely looking at fully developed seas and these signs discussed here will appear relatively quickly with the new wind speed. And example of 15 kts, ie we do not have to look for the whitecaps, but we are also not overwhelmed by the whitecaps. The picture above was at about 1500 PDT, during the flat period here of sustained 15-16 kts. 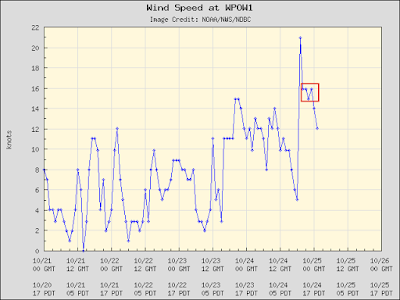 This wind meter is on a low flat point of land about 0.4 nmi behind the gray sails and known to be a good measure of wind speed in the area of the picture. Conspicuous spray blown off the crests of whitecaps and streaks of foam are the signs of 30 knots of wind. This, however, is very strong wind, indeed. There are not many places close to land where such winds last more than an hour, and even in these places, if this wind persists for over an hour it must be associated with a large weather system that would have been well forecasted. In a solid 25 kts of wind, you will see patches of spray indicating some 30-kt gusts, which in a sense helps ID the base strength of about 25 kts.That is, a sustained wind of 20 kts will not have many if any gusts to 30 kts, and hence no patches of spray. A sustained wind of 30 knots will likely contain gusts to high 30s. To appreciate the forces involved, imagine holding a two-square foot board (17 inches on a side) out of a car window when traveling at 40 miles per hour (35 knots). 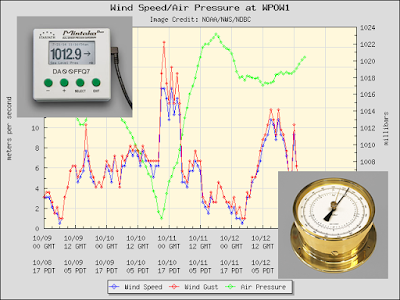 At 40 kts you are generally wearing goggles due to large amounts of spray flying along with the wind. I have little direct experience with wind this strong, but the one time I had more time than I wanted, the thing that impressed me the most was the cat's paws on the wave surfaces. 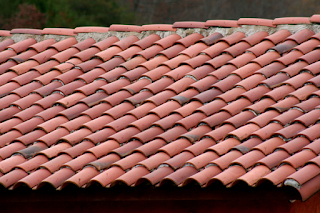 These were no longer painted scallops showing the direction of the wind, but they were deeply gauged, like the wave surface had a thick tile surface. Just for reference, at the low end of the spectrum, 4 knots of wind is the threshold for feeling the wind on your face or neck. This is not a particularly signif﻿icant observation for powerboaters, but it is a fairly accurate measure that might be of interest to sailors. Weaker winds (1 to 3 kts) can be seen to move smoke (ie incense stick) but are not felt... unless, of course, you are a very sensitive person. If you can definitely feel the wind on your face, it is more like 4 knots or more. In Puget Sound and connecting waters the fetch of the wind (which affects the wave heights) varies significantly with location and wind direction. 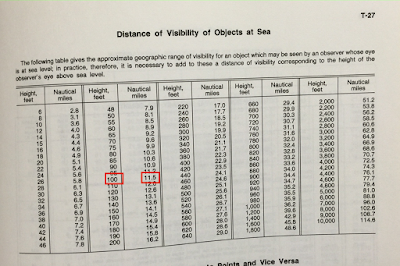 In the Appendix to Marine Weather of Western Washington there is an extensive set of tables that compute wave height as a function of duration and wind speed at various locations around Puget Sound, Admiralty Inlet, and Strait of Juan de Fuca. .... just found by accident where else we had these notes, in our public online Glossary, but we will leave them here anyway. This link has historical notes on the scale as well. In principle our weather students would have found this discussion there, which is likely why it has not come up in other discussions. Ship captains often prefer their barometers set to read sea level pressure (SLP) to simplify weather reports and comparisons with weather maps. 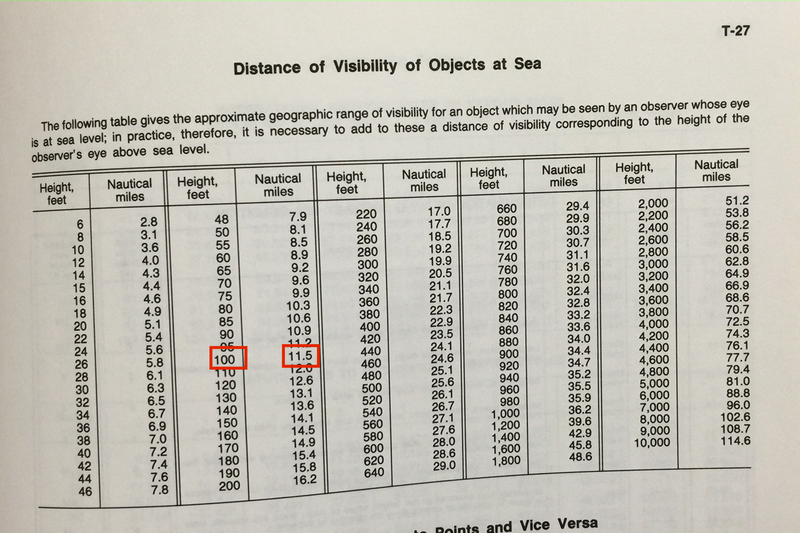 Recalling our jingle "point four-four per floor" as a reminder that a 12-ft change in elevation corresponds to a pressure change of 0.44 mb, we see that a large ship could easily have a correction of 3 mb or more, depending on the instrument height above the water. 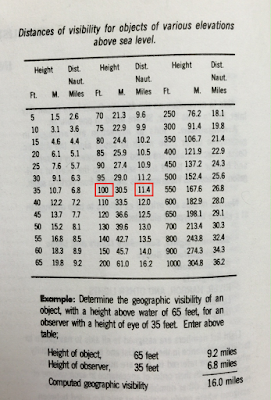 Also it is not always easy to determine the actual barometer height above water level when it is 5 or 6 levels above the main deck. Sometimes the value historically assumed on board could be more an anecdotal value than one rooted in an actual measurement or taken from ship's drawings. This question and be answered—or even by passed—with an accurate, portable barometer. First, such a barometer could be used as an accurate altimeter to measure this height difference in feet or meters, or as we note here you can use it to circumvent this question, and set the ship's barometer directly without the intermediate step or knowing or measuring its height above sea level or a specific water line, such as the Summer Load Line. In short, we just measure the pressure at sea level with an accurate portable barometer then proceed to the ship's barometer and set it to that value. This involves writing down the pressure at sea level because it will change (decrease) as soon as we move up the ship. And since this process must often be done in a short time with numerous distractions, this writing it down offers a chance for error that could have long term implications to the weather work of the vessel. Some electronic barometers offer a special option to record a specific pressure at a time of your choice, and most all accurate aneroid barometers have a set needle to mark a specific pressure. Step 1. Hold the barometer at or near sea level for a minute or so, tapping the dial of aneroids as needed, then log the pressure or set the needle. See Note 2 on the use of different reference levels. 1. We need to hold the portable barometer near sea level (or at any reference level we are using) for a few minutes because electronic instruments might be averaging over some time period (check the manual) and aneroid barometers take some time to adjust, especially if you have brought it there fairly quickly from a notably higher location. 2. We have shown Step 2b schematically using the waterline as a reference for the height measurement, but it could be done using the summer load line level for this reference. Our jingle for the size of the correction keeps this difference in perspective. 3. 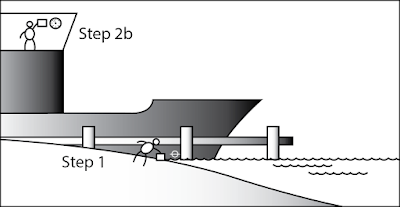 The height measurement in Step 2b, regardless of reference level selected, does not depend on tide height. But the Step 2a procedure of setting the ship's barometer to read sea level pressure does in principle depend on the tide height. In many cases this will not matter, but in harbors with large tidal ranges it could well be that the height of the water does not represent mean sea level. We have discussed this issue in an earlier note called Mean Sea Level, Tides, and Barometers. AP Release on Tragic Loss of El Faro is Misleading. 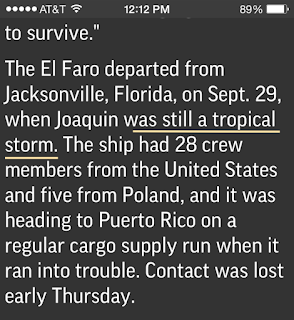 It is indeed true that when the ship left the dock in Jacksonville the system was a tropical storm. I am not sure what they meant by "still a tropical storm" but it was indeed a tropical storm. But that is not the issue at all. At the time they left the dock, this was the forecast from the NWS. 34 KT....... 0NE 60SE 0SW 0NW. 12 FT SEAS.. 90NE 90SE 60SW 90NW. 34 KT... 30NE 60SE 20SW 20NW. 34 KT... 30NE 60SE 30SW 30NW. 34 KT... 50NE 70SE 50SW 50NW. 34 KT... 90NE 90SE 80SW 90NW. 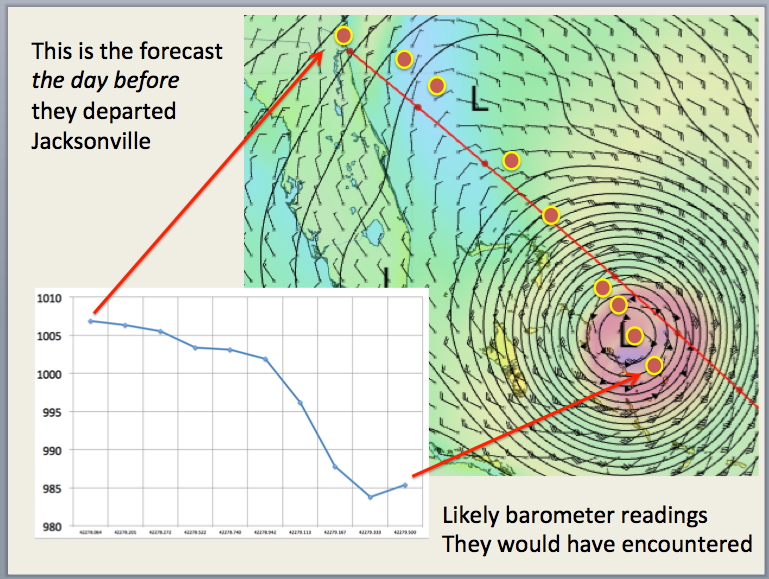 Below here we see that the forecast at the time of departure was indeed very good, and when you fold into this the standard Mariners' Safety Rule 1-2-3, we see that there was not any way to bypass this system on the way to Puerto Rico. See also the similar warning at the end of their forecast. In short, the AP note on what was there at the time and not saying what was actually forecasted at the time is negligent reporting. Later we did more analysis of this voyage, comparing the forecast that was available before departure with what took place, along with a projected pressure profile that would have been measured on board with an accurate barometer. Top left are known positions. Bottom right are the interpolated GFS predicted wind and pressure for those times and positions. 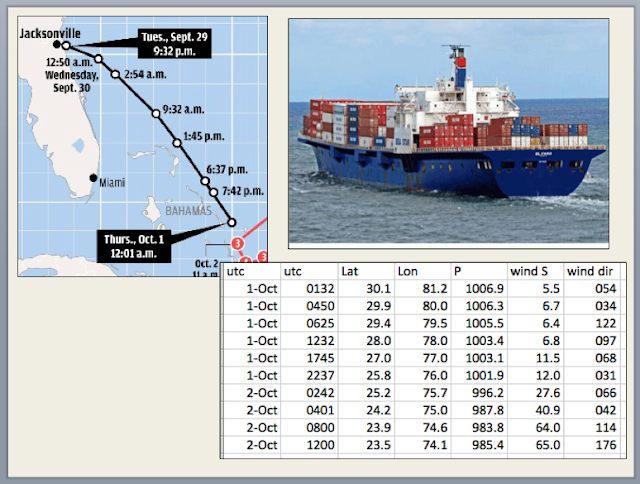 This is a plot of the planned route and the available forecast for the final day of the voyage that was readily available to the public the day before the vessel departed. 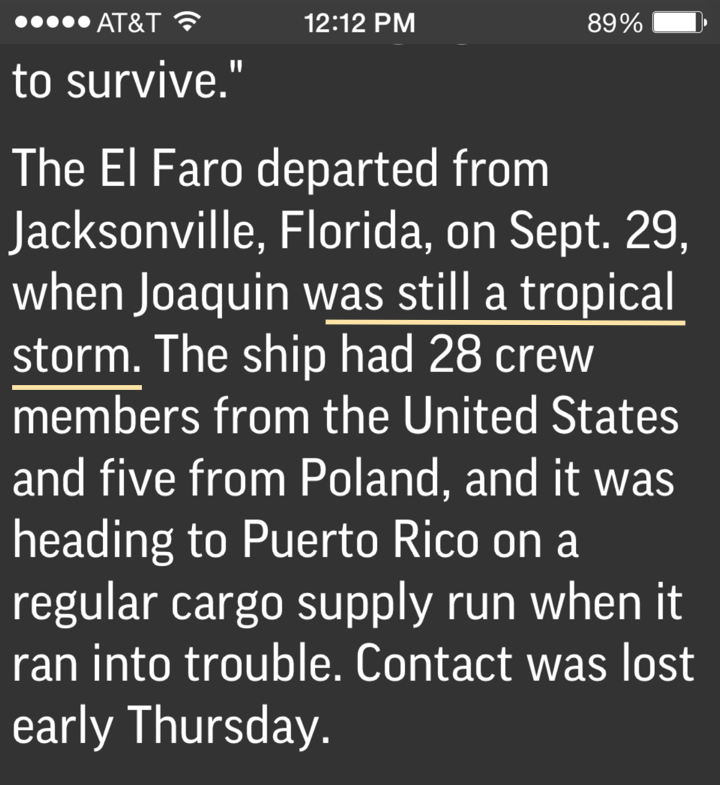 In other words, the AP release is true, in that the system was indeed a tropical storm when they left, but at that same time it was also known that it was going to be an actual hurricane when they would meet it. The insert on the bottom left is the pressure trace that would have been observed on board over the voyage. 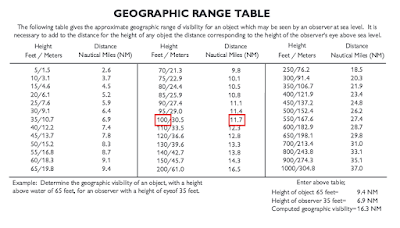 Geographic range is how far you can see (by means of visible light) the tip of an unlighted object in crystal clear visibility on a spherical earth... even with binoculars; this is not a matter of eyesight, it is a matter of the line of sight being blocked by the curvature of the earth. This has been part of the science of navigation since the earliest days, when the first vessels sailed off and dropped below the horizon to those waving goodby on shore. In fact, in crystal clear air (no pollutants) and total absence of clouds, it also does not matter if the tip has a light on it or not. That light will dissapear from sight when it passes beyond your geographic range to the light. 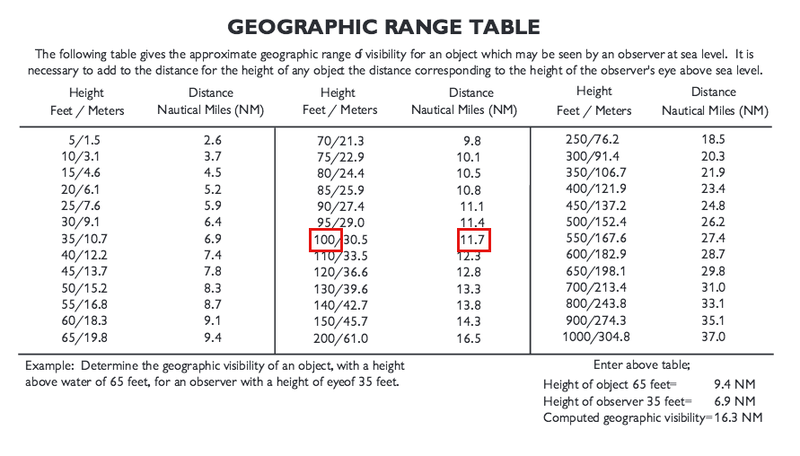 Note this says your geographic range, not the geographic range of the object, because this geographic range (Rg) depends not only on the height of the object above the water (h), but also the height of the observer's eye above the water (HE) as well. Those standing on shore will lose sight of the ship sailing away before those watching from a nearby hill top. The question at hand is: what is the formula for Rg, and how does it depend on h and HE, and maybe other things as well. Rg = sqrt (2R) x [ sqrt (h) + sqrt (H) ]. The tricky part is the units. We (American navigators) want h to be in feet and Rg in nmi, so we must tweak the conversion factors. for a spherical earth with no atmosphere. But there is indeed an atmosphere and that atmosphere tends to bend the light rays up and over the horizon a small amount, so the actual theoretical range in a typical atmosphere is about 10% larger than this estimate, and now we have reached the trivial aspects promised by the title. When we first started actively teaching navigation in the early 80s and even extending at least into the 90s, official navigation sources did not agree on how much this refraction correction should be to account for the typical conditions. The 1.06 was replaced with something between 1.14 and 1.17. The sources available in, for example, the USCG license exam room included: Bowditch (1.17), the USCG Light List (1.14), and the NOAA Coast Pilot (1.15). We did not pay too much attention to that, other than noting they did not agree, because in our teaching we approximate this range even more, and simply drop the leading factor completely. The working value of Rg we use in our teaching (and easily remember) is about [ sqrt (h) + sqrt (H) ], with no factor at all. That advice remains what we recommend today. We can always add that it might be in some cases about 10% bigger, but do not count on it. In fact, in those days we spent quite a bit of time sailing away from bright red empty fuel containers to see how long we could indeed see them with binoculars, and did other measurements from landmarks. We concluded that any disturbance of the water or deterioration of the visibility dropped this theoretical range at least 10%. In waves of any size, it drops even more. 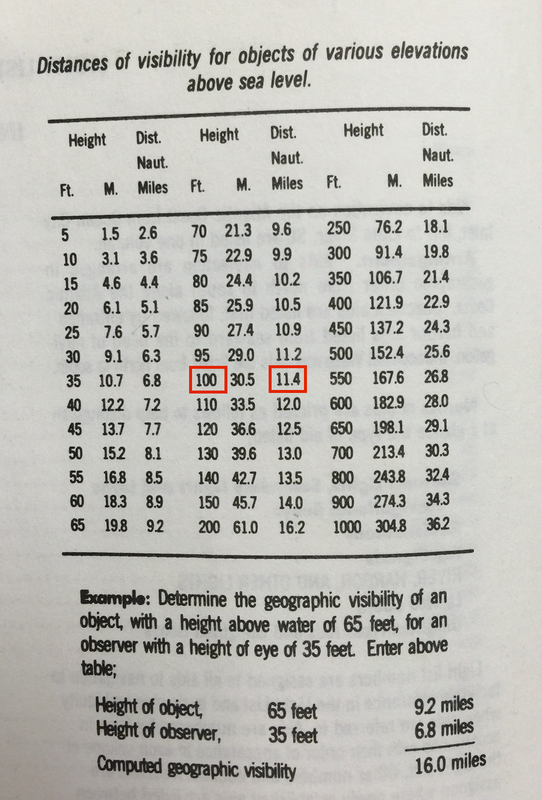 Thus the easy to memorize value is good enough, especially because this is important to know by heart... it it tells you how far you can see someone how might have fallen over board, or how close you have to be to see a landmass. The more this is "less like a formula" the better. Rg = 1.06 x [ sqrt (h) + sqrt (H) ]. To be fair, in our approximation we are addressing one specific aspect of this concept. 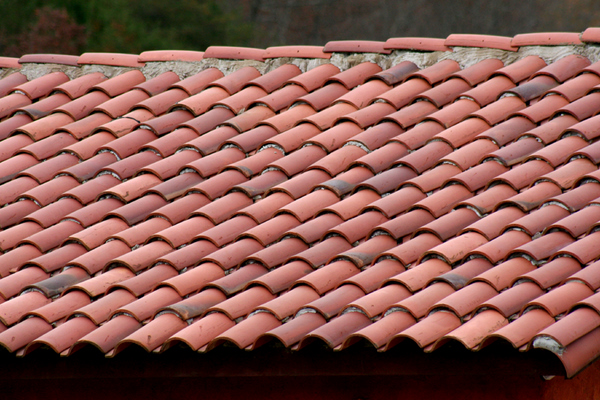 In other applications the value is more important, which has led to quite a bit of study. It is, for example, more important in cel nav than in coastal navigation, and sets the limits on how accurate we might predict the time of sunrise and sunset, to name a couple. One of the leading experts on this subject is Andrew Young at San Diego State University. This link to his work cited above has many links related to this topic. The uncertainty in the value comes from the fact that refraction, especially near the surface, depends on many things—not just air temperature, but also on sea state and wind, and probably the water temperature as well. That first meter above the water surface that these light rays must traverse is a very complex bit of atmosphere. He is also an expert on the closely related topics of mirages and the green flash. In sort, geographic range remains about a ± 10% number. It helps to keep that in mind when we use a piloting technique like bobbing a light, which can determine a remarkably accurate moment. It is just when we convert that moment to a distance off that the light that we should recall this limitation. So now we are off to replace any 1.14 or 1.15 we find with 1.17, while still recommending 1.00, with maybe an optimistic or special circumstances addition of 10%. Ironically, though all official sources now agree on 1.17, the USCG exam room is still using tests and reference books based on the early values that maintain the inconsistency. To its credit, in a sense, Bowditch has had 1.17 since at least 1980. For completeness with regard to the introduction, geo range of a light is affected by fog or pollution as it can create a glow that indicates the light before you can actually see it, and a low ceiling of clouds can give rise to a loom over the light that might extend its visibility tremendously. The loom of a bright city, well below the horizon, might be seen 60 miles or more offshore.